We recognize that God has expressed creativity as a core attribute in His creation. A walk through the halls of LCS is like a stroll through an art gallery as student work is on display for all to appreciate and enjoy. 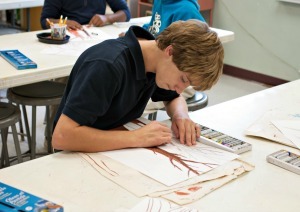 Students in kindergarten through eighth grade receive expert instruction in art, using a wide variety of techniques and media. Instruction in art history is incorporated into fun and exciting projects at every level. Students also participate in art competitions and select artwork from each student is showcased at an Art Fair in the Spring.